Are you seeking an outdoor adventure for your next vacation? I’ve got a few ideas that will satisfy that itch for adventure. The Pensacola Bay area is the gateway to the sunshine state. We’ve got the emerald waters of the Gulf of Mexico and gently flowing rivers winding through beautiful forests. Snorkeling: Grab some snorkeling gear and explore the artificial reef system on Pensacola Beach and Perdido Key. Park East is located about 1.4 miles east of Portofino on Pensacola Beach. The reef on Perdido Key can be accessed from the public beach area off Sandy Key Drive. The reefs are located 500 ft. off shore, so make sure to bring the appropriate snorkeling gear and prepare to see fish, sea turtles and more! Learn to Surf: No board, no experience, no problem. The crew at Waterboyz Surf and Skate offers surf lessons and weekly surf camps during the summer. Having grown up surfing on Pensacola Beach I’d highly recommend learning. I love paddling out and watching dolphins, rays and sea turtles enjoying the emerald waters of the Gulf of Mexico. Give them a call…. Surfs up! Zip Adventures: There’s ziplining; then, there’s a zip adventure. The difference? A zipline usually takes you from Point A to Point B and the thrill is gone. A zip adventure is a series of ziplines, totaling up to a mile long. Adventures Unlimited offers a series of ziplines that take you on a treetop tour of Northwest Florida’s Wolfe and Coldwater Creeks. Adventures range from $80 to $130 and take anywhere from two to five hours. Tower Climbing: Big Lagoon State Park is 655 acres of activities for everyone. Take in the natural surroundings and meet the local residents like Blue Herons and hawks, kayak through the salt marshes or fish. Be sure to walk to and climb the three-story observation tower for breathtaking views of the park and the Intracoastal Waterway. On your walk back, stop by Long Pond, known for alligator sightings. Entrance fees to the park are $6 per vehicle. Kayaking: The views are great from the tower at Big Lagoon State Park. Some of the best around! One observation you may discover is the winding inlets waiting to be explored by kayak. As you paddle you’ll get to watch heron’s, osprey, eagles and all kinds of sea life. Pensacola Geo Tour: This is an on-land treasure hunt that allows families and children to explore Pensacola’s award-winning beaches and destinations in a fun way through geocaching. Visitors use GPS-devices (mobile phones) to locate clues hidden across the city. You can select from four different trails or complete them all for a prize. 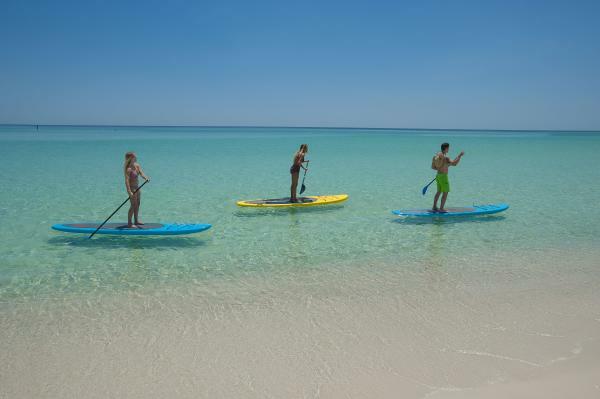 Paddleboarding: This is my vehicle of choice for enjoying the Gulf, bays and rivers in the Pensacola Bay Area. It’s a great natural way to explore the coastal regions and get some good exercise while you’re at it. There are many outfitters who offer both lessons, rentals and fitness classes on paddleboards. Birding and Nature Trails: For explorers seeking the rare and unique, patience and poise are key while journeying through one of the Pensacola Bay Area’s many nature trails. Tarkiln Bayou Preserve State Park boasts the extraordinary, carnivorous white-top pitcher plant. It’s also where the world’s greatest concentration of insect-eating pitcher plants species can be seen. 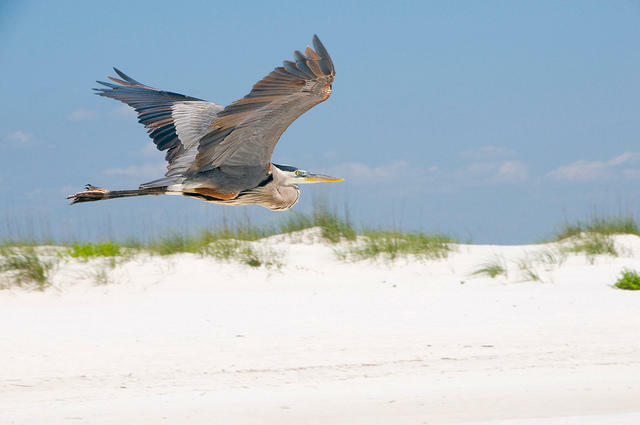 More than 280 species of birds can be seen along the trails of the Gulf Islands National Seashore, including spotted sandpipers, osprey, herons, warblers and plunging gannets. Part of the Great Florida Birding Trail, ECUA Bayou Marcus Wetlands features nearly 8,000 feet of boardwalk through wetlands where Swamp, Song and White-throated Sparrows exploit the weedy edges and Brown-headed Nuthatches and Pine Warblers call from the adjacent pinewoods. Big Lagoon State Park boasts unique birds such as Common Loons, Great Blue Heron and Yellow-billed Cuckoos. Located on the University of West Florida campus, the Edward Ball Nature Trail provides a glimpse at wintering Blue-winged Teal, Hooded Merganser, Bufflehead and the odd Groove-billed Ani. Pensacola Beach plays host to the Footprints in the Sand – Eco Trail where visitors can learn about native plant and animal life through educational signs posted at key locations across the beach, each one focusing on a different ecological topic. Enjoy your adventure in the Pensacola Bay Area, and be sure to share your experience with us by tagging your photos with #ExplorePcola!